The Spring River located in southwestern Missouri, southeastern Kansas, and northeastern Oklahoma begins in southern Lawrence County, Missouri south of Aurora. It goes north of Verona and turns west across Lawrence and Jasper Counties before crossing into Cherokee County, Kansas. It flows past the east sides of Riverton and Baxter Springs before emptying into the Grand Lake o' the Cherokees in Ottawa County, Oklahoma. The main attraction in Kansas is the Spring River Wildlife Area, which was acquired by the Kansas Department of Wildlife & Parks in November 1992. An additional tract of 62 acres was donated in December 1996. 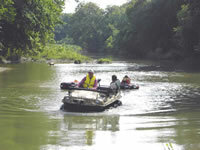 The Spring River Wildlife Area is unique in that it is the only Kansas public wildlife area located within the Ozark Plateau. The Spring River borders the east side of the property for a length of .8 miles. An Ozarkian forested sandstone bluff along the west side of the river gives the area a unique quality. Meeting atop the wooded bluff, an undisturbed prairie meadow is noted for its wildflower diversity. Native grass plantings have replaced most of several small agricultural tracts. Trees on the property are dominated by numerous oak and hickory species. Primary use on the property includes hunting, hiking, wildlife viewing, fishing and mushroom/berry picking. Species hunted include whitetail deer, eastern turkey, mourning dove, bobwhite, fox squirrel, gray squirrel and cottontails. Fishing opportunities are limited due to hike-in only access. Fish species include channel catfish, flathead catfish, spotted bass, smallmouth bass and longear sunfish. Principal management practices on the area include prescribed burns, wildlife plantings and native grass restoration. The property is managed with federal wildlife restoration money, state wildlife fee fund money and from agricultural income generated on the property.